Apollo’s Hegemony NAC is a dietary supplement containing 500 mg of N-acetyl L-cysteine per capsule. N-Acetyl L-cysteine (acetylcysteine, NAC) – an organic chemical compound, N-acetylated derivative of the protein amino acid L-cysteine. It is a glutathione precursor, thanks to which it can efficiently support the fight against oxidative stress. In medicine it is used mainly because of its mucolytic effect and medicinal properties in the case of paracetamol overdose. It is popular among bodybuilders, who use it in order to limit the side effects of stimulants. In order to stay in good health for a long time and deal with threats, the human organism has developed natural defence mechanisms. One of the key elements of the barrier is glutathione – the major endogenous antioxidant. It exhibits the ability to donate an electron to reactive molecules that damage our healthy tissues, that is free oxygen radicals. Reactive oxygen species (ROS) are destructive molecules, a by-product of aerobic transformations that happen in the organism. If they are produced intensively enough to exceed the number of antioxidants that circulate in the body, there occurs a risk of many consequences for health, including faster aging of the organism and more intensive processes of carcinogenesis. A key to maintaining homeostasis is the right supply of antioxidant substances, among which the most interesting and efficient is undoubtedly NAC. One of the applications of acetylcysteine is reducing the viscosity of mucus in such ailments as cystic fibrosis or bronchitis. Its beneficial effect stems from its mucolytic properties, that is the ability to break disulphide bonds in the polypeptides of mucus, thanks to which it becomes more liquid and easier to remove, which in turn helps to clear the air ways. Another important application of acetylcysteine is its use in the case of the poisoning with a popular anti-inflammatory drug – paracetamol. One of the drug’s toxic metabolites is N-acetyl-p-benzoquinoneimine, and using NAC contributes to its faster metabolism. Thanks to that intervention, it is possible for the liver to keep working efficiently in the case of an overdose. A very interesting property of NAC is the ability to support the battle against various addictions. Scientific studies report that effect with regard to addictions to marijuana, cocaine or cigarettes. A test conducted on smokers demonstrated that the number of cigarettes smoked was reduced by about 25% as soon as after four weeks of supplementation with 2,400 mg of acetylcysteine a day. What is more, a test conducted on young people who described themselves as addicted to marijuana where 2,400 mg of NAC a day was administered in two equal portions for four weeks demonstrated a reduction in the symptoms of the addiction in the form of a smaller urge to reach for another portion. In the case of cocaine addicts, they were administered 600 mg of NAC every 6 hours during a 3-day hospitalisation. The results are also promising in this case, as the symptoms of withdrawal were reduced and the urge to take the drug was subjectively less pressing. Considering that NAC is a remarkably safe agent with beneficial effects on health, you can draw the conclusion that the supplement is highly advisable for people who suffer from the excessive urge to use recreational agents. Acetylcysteine can also be beneficial for people who take advantage of the recreational properties of alcohol. Supplementation before consumption (about 30 minutes) can reduce its negative effect on the liver, the most common side effect of alcohol. Using NAC is also a popular method among people who want to prevent the second day syndrome, commonly referred to as hangover. NAC can also limit the damage that occurs in mitochondria as a result of excessive alcohol consumption; therefore, supplementation can bring long-term benefits for people who drink too much. Higher-level sports are usually connected with the use of various types of hormonal support. That method of improving results can potentially result in the occurrence of side effects. In order to prevent them, proper preventive healthcare should be taken care of, and NAC seems to be a versatile agent that supports health in several areas particularly interesting for sportspeople who use stimulants. Protecting the liver is a basic matter to take care of, especially in the case of oral agents. Because of its ability to increase glutathione levels, acetylcysteine proves fantastic in that respect with its great results. Another problematic effect of using stimulants can be the deterioration of skin quality: increased oiliness and more frequent blemishes. As a study suggests, using NAC for two months in the dosage of 1,200 mg a day can reduce acne even by 50 per cent! During intensive and frequent trainings, there are enormous amounts of reactive form species produced. As you already know, acetylcysteine helps to neutralise them efficiently, thanks to which it is possible to keep oxidative stress within the physiological norm. Acetylcysteine exhibits the ability to cross the blood-brain barrier, thanks to which it can increase glutathione levels directly in nervous tissue. In turn, the substance swipes free oxygen radicals produced during, for example, neurotransmitter metabolism, protecting nerve cells from damage. Another protective property is reducing excess glutamate, which can be toxic for nerve cells. Apollo’s Hegemony NAC is recommended for people who want to enhance their overall health by reducing excess oxidative stress. There are particular benefits waiting for sportspeople who use hormonal stimulants, and people addicted to various kinds of recreational substances. 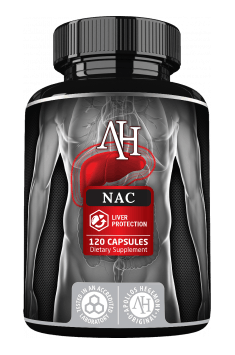 NAC Liver Protection 120 caps. As a dietary supplement, take 1 capsule with a meal 1 to 3 times a day. The recommended use of acetylcysteine is the range of 300 mg to 2,400 mg a day; however, for maximum efficacy, the range can be narrowed to 1,200-2,400 mg. The lower limit should prove efficient as preventive healthcare and support for liver functions. In more serious cases, such as fighting an addiction or using steroids, it is advised to take larger amounts. Preferably, split the daily dosage in two or three portions and take them at regular intervals. The duration of supplementation is strongly dependent on its purpose. In some cases, the effects can be observed immediately, while in other cases – even after two months.